Prisoners make woven furniture at Penal Colony No. 10, Yekaterinburg. Like anywhere else, many criminals in Russia fall back into their old ways after being released from prison. Some former inmates have, however, reformed enough to become successful entrepreneurs who have started their own business after learning the necessary professional skills in jail. In Russia, as in many countries, the issue of the socialization and employment of former prison inmates is a pressing one. Many of those who wish to find a suitable job encounter suspicion and reluctance from various companies and individuals about hiring former convicts. Others do not have the necessary skills and have forgotten how to be independent. There are more than 600 different state and private structures today to assist the former detainees to find a footing. According to Olga Romanova, director of the Rus Sidyaschaya Convict and Their Families Assistance Charity Foundation, "the Russian government practically doesn’t deal with the rehabilitation of former convicts" and, barely one tenth of the needy receive any real help. Yet there are often amazing cases of private initiatives, when former inmates have not only established their own businesses but also helped others find work. Yevgeny Morozov had been sentenced to a correctional colony in the Ivanovsky Region. When he was released, in October 2015, he founded a carpentry workshop in the Moscow suburb of Noginsk, where he makes customized furniture, along with former inmates. In just half a year, his inexpensive and quality furniture has become incredibly popular among the local population. 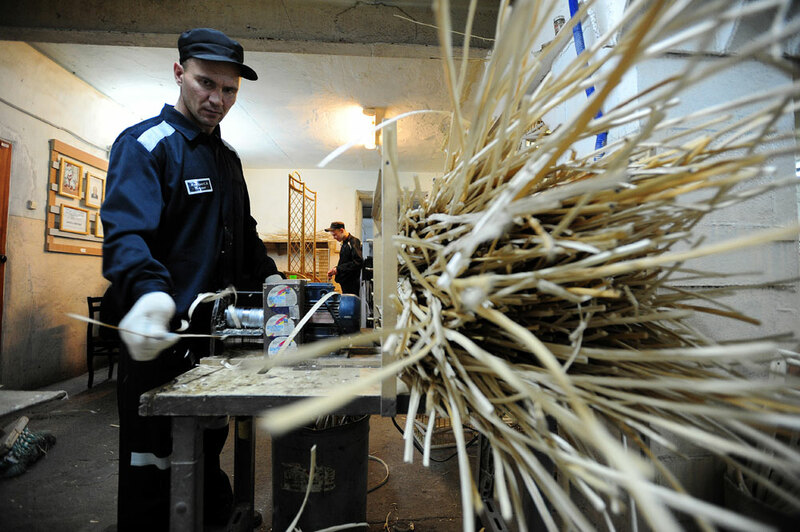 "The idea to set up a carpentry workshop came to me in prison," said Morozov. "I saw that many people there are fine carpenters. Their woodwork was really good. Then we had a sort of a dream: to get out and set up a workshop." In prison the inmates work from 8 a.m. to 11:30 p.m. making furniture, working with metals and textiles, sewing bed linen. This is mandatory service. "If you miss your shift, you are placed in a punishment cell,” said Morozov. “The highest salary is 1,500 rubles ($22) per month, but normally it is 600-700. The inmates can choose the work they will do. That's how I learned carpentry." After being released, Morozov would take on construction contracts. Then, after saving up for his own business, he opened a workshop. The enterprise is small. Only eight people work with the director in a space that is 300 square metres in size. Morozov’s wife does the advertising, manages the site and helps former convicts in neighbouring regions find stable work, which is often difficult. "It often happens that for a year or two after being released, the ex-convicts sit around without work, drinking," he said. Positive progress has been made in the most delicate sector: the rehabilitation of adolescents who have committed crimes. Much has been done so that adolescents would not be sent to prison. From the beginning of the 2000s, the number of adolescents sentenced to terms in juvenile correctional facilities has fallen significantly. There were 16,491 adolescents in correctional facilities in 2003, while the number in 2015 was down to 1,683. Until the age of 18, many offenders manage to get away with probation periods under which they have to fulfil certain requirements to remain free: respect a curfew, continue their education or work. Twelve years ago, a unique organization was founded in St. Petersburg, at the initiative of the head of the Church of Holy Martyr Anastasia of Sirmium, on Vasilevsky Island; the St. Vasily the Great Centre for Social Adaptation. The only non-state organization in Russia that works with problematic adolescents without remuneration, it provides room and board for them and finances their activities. The director of the rehabilitation programme believes it is important that a juvenile offender does not remain at home since he will be surrounded there by all the things that once led him astray. Also, in the event of probation, an adolescent at home does not feel he/she is being punished and this raises the chance of their repeating the offence in future. Around 210 people have lived in the centre over 12 years and fewer than 20 of them have committed an offence in their adulthood. "We understand what a juvenile colony is and that it is better for an adolescent not to wind up there," said Denis Nikitenko, a collaborator at the centre. "The existing punishment system does not correct people, especially adolescents, whereas we don't have a fence or barbed wire. The kids do sports, parkour, ball dances, pottery and all this is free." There are, however, certain duties here: attending museums and theatres, painting pottery. All the earthenware at the centre is produced there. The adolescents from the St. Vasily the Great Centre, just like the entrepreneurs who are released from prison with a dream of opening their own workshop, are still only a small but positive exception from the norm. According to the Russian Federal Penitentiary Service, as of the beginning of March 2016 in Russia there were 650,613 inmates. The majority, 526,343 people, live in correctional colonies. In Russia there are 720 of these. According to Federal Penitentiary Service statistics, in 2015 194,310 people were imprisoned for the first time, while 199,472 people were imprisoned for the second, third, fourth or fifth time.